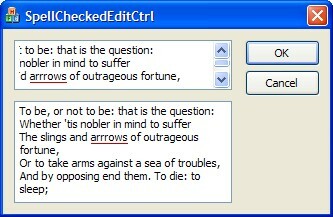 Sometimes, it would be nice to have an edit box with a spell checker and/or thesaurus built in, especially if you use edit boxes to enter longer messages (E.g. for logs, descriptions, IM messages, ...). While searching the web, I found some free spell checkers, but most of them didn't work on Windows, or missed many language dictionaries. Then I found MySpell which is used by the free OpenOffice suite. It is distributed under a BSD license, which means you can use it in commercial applications. You just have to mention the copyright somewhere in your app. And since MySpell is used by OpenOffice, there are dictionaries for almost every language available. 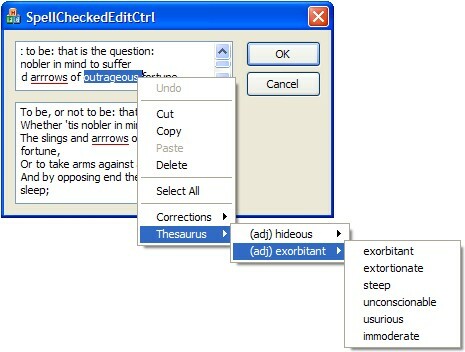 And those dictionary files are compatible with the ones Mozilla uses. Add the files SpellEdit.h, SpellEdit.cpp and all files in the MySpell folder to your project. Replace all CEdit variables with CSpellEdit (don't forget to #include the SpellEdit.h file). If those strings are not present, then the default English strings will be used. 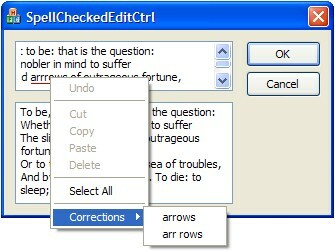 Also: if no dictionary files are found or set, then the CSpellEdit control will do nothing, i.e. it will be exactly like the normal CEdit control. If you don't want to store the dictionary files in your program's folder, you can set the paths to the dictionary files with the SetDictPaths() and SetThesaurPaths() methods.